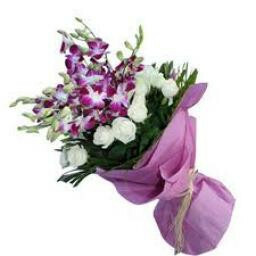 Send this dazzling bunch of new orchid with exquisite white rose in decent pressing to your adored once. A pack of 3 Orchid and 10 white roses in pleasant paper pressing. A pack of 3 Orchid and 10 white roses in pleasant paper pressing.